Guest post by Covesting, who we recently featured. The biggest barriers to entry and mistakes new potential investors are making can often cause many new potential investors in the Cryptocurrency world to shy away from crypto. The recent success of Bitcoin and Ethereum has quickly gained notoriety across the globe on many different media platforms, sparking an influx of newly interested investors who face a challenge in trying to learn the ropes of the many intricacies that go into buying and securing coins and tokens. Unsure of where to buy Cryptocurrency, and unwillingness to go through length identity verification processes needed to make an initial purchase. Lack of understanding of how to send, receive, and store Cryptocurrency securely. Many new ICOs are scams, or have no intention of following through on the projects they claim to be able to build. Bad decision making; many new investors often will panic-sell currencies that are dropping and buy the latest currency to increase 20% in the last 24 hours…often leading to a correction in the opposite direction. Many new investors fall prey to bad information, or terrible advice. Online channels where members share investing advice often has purposely misleading information, uneducated opinions, and dangerous advice for new investors. Covesting, a fintech start-up by former Saxo Bank traders, has developed a revolutionary new platform using one of the hottest trends from traditional investing. Their platform allows users to deposit BTC, ETH, and even fiat (like EUR and USD) and then “subscribe” to professional crypto currency traders who are searchable by investment strategy, risk, past performance, user reviews, and popularity. By subscribing, Covesting’s platform will automatically replicate all the trades made by the professional trader in real-time. Covesting is planning to establish partnerships with various cryptocurrency exchanges, which will allow professional traders to use any of those platforms to make trades and in turn make trades on behalf of the investors who subscribe to them. Users only pay a small percentage of profit, and will not be subject to paying any professional trader who doesn’t prove their value by earning them money. Users can also subscribe up to 20 different professional traders at one time, allocate different percentages of their portfolio to different traders, and unsubscribe from a trader at any time. Have you ever woken up from a night’s sleep only to realize a 20% drop in your portfolio because a regulatory change in China crashed the market? One of the biggest challenges to being a successful investor in crypto, is the amount of time needed to make informed decisions. Often, breaking news, or sudden changes can cause huge swings in demand in either direction for many or single cryptocurrencies. 99% of investors do not have the time to monitor 24/7 news cycles that affect the crypto sector. One of the biggest changes from traditional investing with stocks, is the crypto market is a 24/7/365 day business, and those who are able to focus their full attention into the industry, will be in a position to make the most accurate decisions. The largest hill to climb for many investors is learning about the hundreds of different coins, how they interact, which coins compete against which other coins, and how news around the globe will affect value. Like many other facets of life, investing requires learning, and the best way to learn is through coaching and mentorship. The Covesting platform allows for “social investing”, users can share their trading history, relevant research they find, explain investment decisions they’ve made, review traders, and form a community. In order to develop the platform within shortest period of time, Covesting team has decided to go for Initial Coin Offering (ICO). 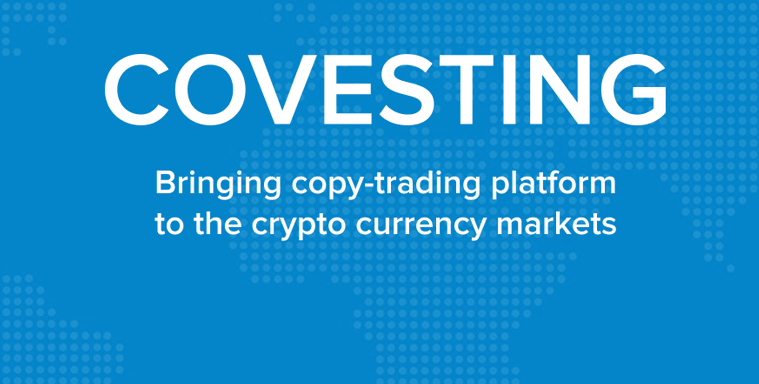 Covesting provides exceptional opportunity to take part in the token crowdsale and benefit from the platform growth by purchasing Covesting Tokens prior to the beta-version launch of the copy-trading system. ICO is scheduled for November 24th , however, there will be a Presale arranged for partners willing to purchase COV tokens prior to the public ICO. Pre-ICO will occur on 20th October – 19th November, 2017. Token purchase rate is fixed at 1 ETH = 300 COV, which offers significant discount compared to an average rate during ICO, which will be 1ETH = 150. As soon as the platform goes live in 2018 the price of the COV coins is expected to go up as more traders, experts and investors join the bandwagon, thus, creating a higher demand for these coins. The company has allocated a total of 1,500,000 COV for this purpose and aiming to collect 5000 ETH by selling the coins. Pre-ICO shall be executed on first-come, first-served basis, therefore availability of tokens can’t be guaranteed for all interested participants. Now that many “innovators” have entered the crypto market, the next phase is to continue attracting “early adopters” in an effort to make blockchain technology and cryptocurrency mainstream. Bridging the gap and knocking down the barriers preventing mass adoption is critical in the expansion of the industry. A study by the Cambridge Center for Alternative Finance concluded in May that there were only 3 million people who have actively traded a Cryptocurrency, just .04% of the world’s population. Covesting hopes to change all that.